The freshest shooter to sprout in recent memory, PvZ is shackled by asinine DRM. Sprawling battlescapes, the clatter of small arms, thunderous mortar fire—all things we expect from our Call of Dutys and Battlefields, not so much from developer PopCap, creators of Bejeweled and Peggle. Not only does Plants vs. Zombies: Garden Warfare deliver the grandiose spectacle of combat endemic to its blockbuster cousins, it manages to take the same game modes, upgrade tracks, and classes we're familiar with and do something truly novel for the genre—make them feel fresh. Don't mistake my meaning: PvZ is not so athletic as CoD and it's battlefields lack the scale and multi-dimensionality of DICE's games, but as I got into the rhythm of my first multiplayer match, I got that giddy feeling you get when you're playing something genuinely original. That feeling where you have an idea of how things are supposed to work, but you're not quite sure what's going to happen next—multiplayer shooters don't often do that. Now before I get too gushy, let's put all the cards on the table: PvZ is online-only. Forget the fact that playing PvZ solo is even more isolating than playing Left 4 Dead alone: if your internet connection drops, you won't even be playing the menu screen. This also means there's no co-op LAN play—yes, EA, people still do that. There are a lot of folks out there living with spotty internet access, and being completely cut off from a game you put down cash for gives PvZ a pretty funky odor. Now to the fun part. Packed in the center of a crumbling graveyard pavilion, my three co-op partners and I are barely clinging to life. The bug-eyed zombie onslaught swells around us. Their orange road cone helmets and detached screen doors deflect clip after clip of green peas and electrified cactus needles. The garden we've been tasked to protect is safe for now, perched atop a small knoll and surrounded by a menagerie of potted defense plants such as Gatling Pea Shooters and Bonk Choy melee tough guys who pummel anything that scurries within range. This is PvZ's Garden Ops four player co-op mode, and on higher difficulties, it hangs in there with the best 'horde mode' and third-person tower defense games, such as Dungeon Defenders and Orcs Must Die!. The action is heated at the garden's central approach in the pavilion. Our fire-breathing Snap Dragons have both been squashed, allowing skittering explosive zombies to detonate at our feet. As the Sunflower (healer), it's all my deployable healing plant and I can do to keep the team's health out of the red. The Chomper, played by a buddy, burrows underground and hurtles behind enemy lines like a worm out of Tremors. He pounces up from a hole about 20 feet away with a flailing zombie caught between his Venus flytrap-like jaws. Just as wave five of 10 seems to be winding down, a huge Zomboss filling half the screen and wielding an electrified power line pole roars into view. Garden Warfare's co-op shines in these moments, when death is almost certain. Making it through wave 10 and surviving to be airlifted out by Crazy Dave's flying RV requires teammates to constantly communicate and play to the strengths of their class. Garden Warfare's greatest strength is its variety in everything from character customization options and upgrades to its 11 maps. Plants and zombies each have four character classes and six variants for each class, such as Dr. Toxic, a hazmat suit-wearing Zombie Scientist whose radiation gun causes damage over time. Add to that the variant on each of every class's three special abilities and hundreds of cosmetic items, and every match becomes a new spectacle of goofy scenes and interesting team compositions. The one area that's lacking is the paltry four game modes through which to express that variety. In addition to four player co-op, there's 24 player team deathmatch, a capture/defend mode, and Gnome Bomb, which tasks teams with locating a bomb and destroying three enemy bases before the other team. A beneficial side-effect of having few modes is that I never had trouble finding a full or near-full match almost immediately, and matchmaking seems to do a decent job of keeping teams balanced based on player rank. I was also glad that on launch day during full matches, I experienced only slight and very infrequent lag. Defeating your enemies even as your pants are falling off is a great feeling, and my Zombie Engineer has a legendary plumber's crack. 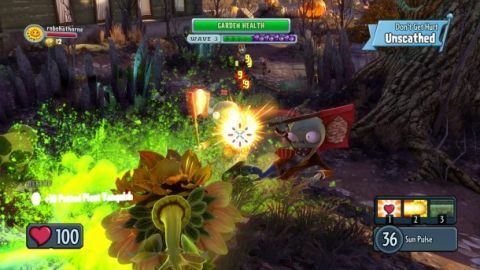 In Gardens and Graveyards mode, the zombies must capture seven locations in sequence within the allotted time while the plants try to defend them—in this case, a path leading to Crazy Dave's mansion. These matches are chaotic from the start and it's not uncommon to die and respawn more than once per minute. Though teamwork may improve as the community matures, it's minimal in these early days after launch, and voice chat is mostly used for trash talk. That said, battles are still won by the team that out cooperates the other. As I coax my plodding engineer to the front, the complex class web plays out around me. Helmet clad All Star zombies rush the line while Cacti perched on rooftops pick-off the laggards at range. Scientists and Sunflowers flit about the field, attempting to balance their healing duties with offensive abilities. In contrast to many other class weapons whose rounds follow a straight path without bullet drop, my Engineer's concrete launcher feels as heavy as it sounds, lobbing chunks of concrete with a satisfying thunk-crash! It's my job to keep the undead war machine rolling by building and repairing teleporters in set locations to allow new units to spawn near the front. When we reach the final capture point, it's a rush to get five zombies through the knot of plants at Dave's front door and into the house. In a miraculous twist of teamwork or dumb-luck, three Foot Soldiers punch a hole by letting loose their bazookas at once—allowing the rest of the horde to swarm the survivors. Activating my jack hammer, I churn Pea Shooters into mulch as I bounce through the door, crack flapping in the wind. This is a game I'm going to be playing with my friends months from now. So if (and that's a big “if”) you've got the internet connection and the stomach for nasty DRM, Garden Warfare is a no-brainer.